Tata Motors produces vehicles both in the Light Commercial Vehicles (LCV) and the Medium and Heavy Commercial Vehicles (M and HCV) segments. It faces higher competition in the LCV segment, where its Tata ACE has been a huge success. Internationalization forms a key component of Tata Motor's strategy and it has successfully entered countries having a demand similar to India like South Africa, Thailand and Argentina, mainly through acquisitions and joint ventures. It needs to improve its product reliability, service network and channel reach in order to maintain and replicate this success in other markets. Some of the recommendations for Tata Motors are exploring mass customization options in the Small Commercial Vehicle (SCV) segment, improving brand reputation and technology appropriation to bring out a world class ultra-HCV segment. Tata Motors is currently India's largest automobile company with revenues of $7.2 billion in 2006-07. It is by far the leader in commercial vehicles and the second largest player in the passenger vehicles market with winning products in the compact, midsize car and utility vehicle segments. Employing around 23000 people and headquartered in Mumbai, Tata Motors became the first company from India's engineering sector to be listed in the NYSE in September 20041. While currently about 18% of its revenues come from international business, the company's objective is to expand its international business, both through organic and inorganic growth routes. A brief examination of the truck industry in India using Porter's analysis helps us understand the threats that Tata Motors faces. The truck market in India comprises the light trucks (LCV) and the medium and heavy trucks segments (M and HCV), of which the M and HCV segment constitutes nearly 78% of the total Indian truck market. The market for light trucks is composed of pickups, vans and coaches weighting up to 3.5 tonnes. This segment has exhibited a consistent growth rate of over 20% in the past 5 years. This growth is expected to continue with the launch of Tata Ace by Tata Motors and similar plans by other players like Mahindra & Mahindra, Eicher, etc. The medium and heavy trucks include commercial vehicles, heavy buses and coaches weighing 3.51-16 tonnes. This segment has stabilized and is expected to grow at 10% over the next 5 years. The major players in this segment include Tata Motors and Ashok Leyland which account for more than 85% of the market. The Porter's analysis for the LCV and the M and HCV segments show strikingly similar results except for the threat of new entrants. In the LCV market there exist a small number of large companies between whom there is a high degree of competition. To gain market share companies are focused on innovation and strong marketing strategies. The companies are usually not diversified beyond automotive manufacture. As a result, if the automotive sector is in a downturn, it could raise exit barriers. Hence the overall rivalry is strong in this market. In the face of such rivalry, let us consider the financial performance of Tata Motors. Over the years the conpany has performed exceptionally well financially inspite of the cyclical nature of the industry. A critical analysis of the financial statements provides us with the following insights. The issue of Cyclicality is plaguing the automotive sector and the future outlook in India is not great considering the robust performance of the past 3 years. Tata Motors has countered this by increasing the share of exports in the sources of revenue. Excess debt has led to a high Debt to Equity ratio and this is not good news as the company plans to go for further capital expansion. 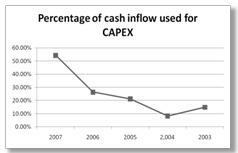 Also the percentage of cash flow used for CAPEX is increasing as shown in Exhibit 1. Rising interest rates in the economy is a cause of concern as it dampens both capital investments and softens the domestic demand. Positives: The cash flow from operations has grown 11 times compared to last year despite a huge CAPEX. Tata Ace single handedly raised the market share of Tata Motors in LCV segment by 5%. The operating leverage for Tata Motors is higher due to the high fixed costs of CAPEX. But still the overall financial leverage of Tata Motors is well under control when compared to Ashok Leyland. As a part of the company's new internationalization strategy, the company has decided to focus on a narrow base of 14-15 countries where market conditions are similar to that of India. In these countries, Tata Motors now has dedicated manufacturing facilities, marketing teams and sales teams. The idea is to have self sustained operations in this narrow band of countries. The company evaluates locations on the basis of market opportunities and labour skills. 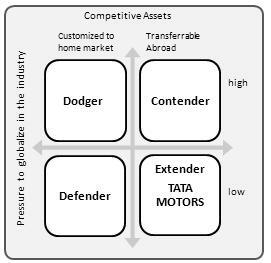 In the framework pertaining to international expansion strategies, Tata Motors can be identified as an Extender, and is focusing on expanding into markets similar to those of the home base, using competencies developed at home (see Exhibit 2). Exhibit 2 Where is Tata Motors now and How to Globalize? Tata Motors entered the advanced Korean Market by acquiring Daewoo, with which it has tremendous synergies in terms of product strategy and R & D. Tata Motors has planned to use this merger and leverage the technology for developing a World Truck for India and international markets. In the export market, Tata Motors moved from a fragmented approach to specific markets, chosen in terms of consumer behavior, distribution networks, supply chain, etc. and identified South Africa as one of the best markets. The sales in this region are about 15,000 units4. This is a significant improvement over what Tata Motors was cumulatively exporting (8000 units) before adopting its new internationalization strategy. Tata Motors formed a joint venture with Thonburi Automotive Plant to enter Thailand. Thailand is the second most competitive market for pickups, and the new pickup trucks developed here will be sold in both domestic and export markets. Tata Motors has taken its alliance with Fiat to produce a new one-tonne pick-up truck, for Latin American markets from Fiat's facility in Argentina. This arrangement will also see Tata Motors forming a joint venture with a subsidiary of Iveco, the commercial vehicle division on Fiat, to set up a distribution network. Now that Tata Motors has established a sustainable model in some countries, its main challenge is to replicate this model in other countries as well. How to replicate this strategy for other markets? In terms of product reliability, Tata Motors offers products of reasonably high standards. However, foreign players like Volvo and even local competitors like Ashok Leyland arguably offer products that are far more refined. But this is more than compensated by a dependable service network and extensive channel reach. Tata's service and distributor network is by far the most extensive of any player in the trucks industry. Hence in overall weighted average terms, Tata Motors still has a winning proposition. In the next section, we provide recommendations that can take this winning proposition even further. Based on a close scrutiny of the resource based view of Tata Motors and the challenges it faces, we propose a recommendation matrix arranged along three broad dimensions - Tangible, Intangible and Capabilities (see Exhibit 4). The strategies in this domain are primarily directed at sustaining Tata Motors' first mover advantage with respect to its offering in the Small Commercial Vehicle segment - ACE. Tata Motors has an unparalleled network of dealers and service stations across the country for Medium and Heavy Commercial Vehicles (M and HCV). However most of these service stations are along inter-city routes. It would need to replicate this network at intra-city level for its hugely successful SCV - the Tata ACE. For this Tata Motors can liaise with small garages, train them and certify them as 'Tata Authorized Service Station'. Tata Motors has positioned ACE as a multipurpose vehicle (MPV). This is where Tata Motors can learn from the Maruti small car strategy that posits that 'there is no such thing as a small car buyer'. Hence Tata Motors should endeavour to move form a multi-purpose positioning to a mass customization positioning for ACE, wherein multiple variants are offered on the ACE platform, each uniquely suited for a specific application - such as tippers, long base trawlers, milk carriers. In intangible terms, Tata Motors needs to bolster its brand loyalty, by providing a unique customer experience. Consider introducing mobile service units for Tata ACE that can respond to customer calls anywhere within a given city. 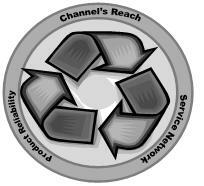 Start treating "Services" as a dedicated profit center. Towards this end, the company should "productize" annual maintenance contracts. Building a reputation will help sustain sales, without having to engage in discount sales. There are two broad capabilities that Tata Motors should seek to acquire. Technology Appropriation is the key to Tata Motor's ambitions to offer products with engines larger than 210 HP. As the share of ultra heavy commercial vehicles grows, the company will need to face up to technologically superior players like Volvo. Here, Tata will have to carefully spearhead its 'World Truck' program by carefully coordinating technology appropriation from its numerous international technology partners, notably Daewoo, Fiat and Hispano. Tata Motors has made significant investments in IT systems to network its countrywide service network. This helps them maintain very high spares parts availability at their service stations and minimize downtime. In the years to come, it would need to include their SCV service station within this framework. This will however be a big challenge, since these service stations would largely be managed by illiterate and not-so-tech-savvy repairmen. Mass customization has its own shortcomings. Firstly, it puts a disproportionate amount of strain on the company's supply chain. And this is a wasted effort in case the demand patterns aren't properly understood. Hence we propose that the sales of the customized vehicles be closely tracked and in case sales achieved within a reasonable timeframe do not merit the additional resource outlay, then the company should revert to the original multipurpose positioning. In the background of rupee appreciation, exports will become costly. Hence it is prudent to open integrated production plants in other countries rather than just concentrating on exports. Compete on price because proportion of individual players is low. Instead differentiate through service. Engage in rapid capital expansion given the high debt to equity ratio. Use ring fencing judiciously. Focus on rapid acquisitions and instead focus on consolidation in the foreign market. Tata Motors has never had it so good. Today the company is the undisputed market leader in the commercial vehicles industry in India and is gradually emerging as one of the key players internationally too. It has been forging ahead on a number of fronts in an attempt to further entrench its position as a market leader. In the SCV segment, the company has witnessed unprecedented success with the launch of the pioneering Tata ACE. 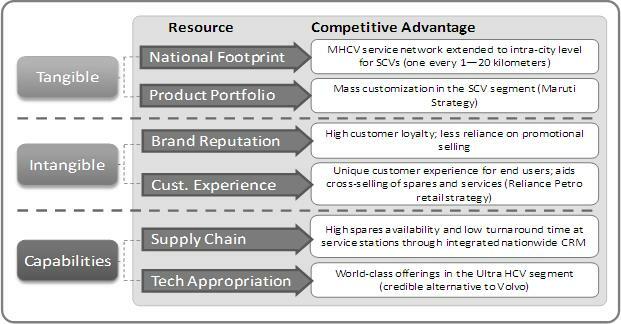 In the M and HCV segment, the company has been taking determined steps to further consolidate its position. The company enjoys a number of key strengths that enable it to present a unique value proposition to its customers. However this success is far from being a given. The company must focus on combining its unique strengths, as it endeavors to replicate its recent successes in new segments and across new geographies. Apart from product reliability, the most important determinant of future success would the company's ability to bolster its support framework. If the company gets it right, the spoils could indeed be breathtaking. Not only will that catapult the company to the forefront of creating a unique customer experience, but also help spawn altogether new revenue streams. The future presents challenges and opportunities for the company in equal measure both domestically and internationally. While pitfalls are many, Tata Motors looks well positioned indeed to capitalize on these opportunities and take on the world.